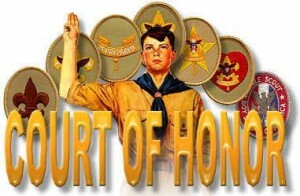 The Court of Honor will be at the City of Lacey Maintenance Administration Building Lunchroom. The location is at 1200 College Street SE, Lacey (across from Walgrens). The building is located on the northbound side of College Street (east) between Lacey Blvd and Pacific Avenue. Access to the meeting room is on the College Street side of the building. There is some parking along the College Street frontage and there is more parking off of Lacey Blvd. Driving eastbound on Lacey Blvd (one way street), cross College street, pass Pints & Quarts and Celebrations (was Lew Rents) and the 3rd driveway on the left is the access to City of Lacey Shop Buildings. Pull in and park in any of the numbered spaces, but do not enter the gated area. Be sure not to park in the Pints & Quarts or Celebrations lots or you may be towed. If you have any rank advancements you would like recognized, please get them to Mr. Johnson the week before (at the Trap Shoot). Troop 101 practices conservation, so please bring washable plates and utinsels from home and when you are done, take them home for cleaning. Wow -- Calendar needs to be updated!